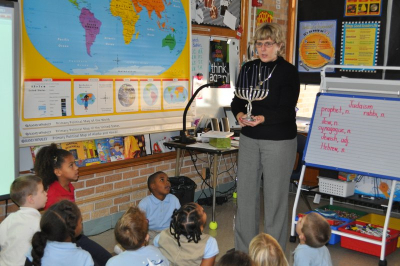 In this photo, first-grade teacher Deborah Fagg from Wichita is giving a lesson on Judaism as part of a unit on world religions. She bought this menorah at a local Target. The children, perhaps none of whom were Jewish, oohed and ahed at the sight as she explained what it was. What struck me: This was an academic lesson on religion, and this was a teacher rather than Jewish parent bringing in a menorah. In my travels, a few Jewish parents told me how they felt obligated to bring in a dreidel or a menorah to teach about Hanukkah or their kids would only hear about Christmas. In this classroom, the kids learn about three religions – Judaism, Christianity, and Islam – and learn about their holidays all over a few weeks’ time in the fall. There’s much more to this story – in my book. If you’re so inclined, help spread the word about Faith Ed. Share the link to the newsletter sign-up. Tell friends about the Goodreads Giveaway.